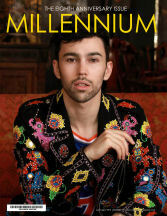 Through a new face of comedy, James Murray spreads his wings with Madison Square Garden, his first published book, and Yanni! Murray reveals what is in store for him and the “Impractical Jokers” for 2018. Staten Island native James Murray is one of the four funny men that brings laughter to households each night. 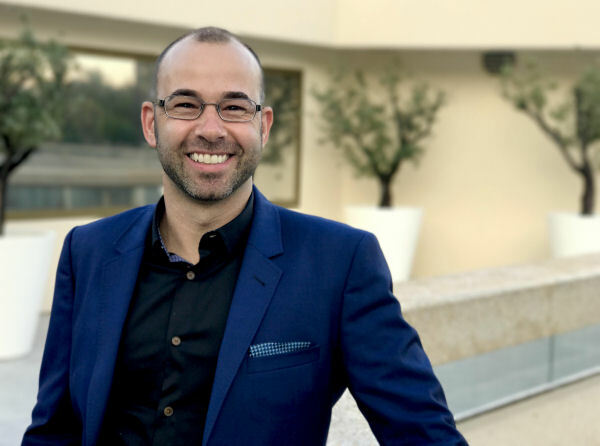 Known as “Murr” to fans, Murray brings his own essence and special ingredient to tru TV’s hit show “Impractical Jokers” now in its 7th season of filming. 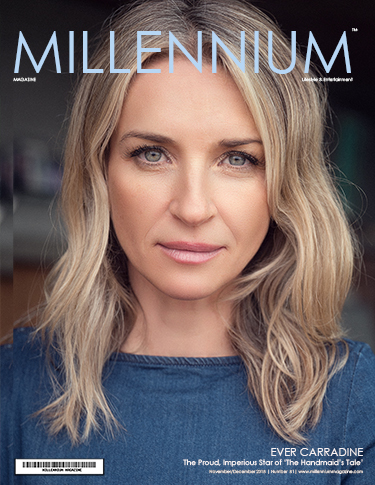 What many may perceive as an overnight hit, Murray and the cast knows that it took 17 years to reach their level of television success that they enjoy today. “Just before the TV show and even now, I’m the Senior Vice President of Development for NorthSouth Productions. My job for the last 10 years was to create and sell TV shows, which I continue to do today. I know how rare it is for a TV show to go more than one season at most. For a show to be in its seventh season with ratings still climbing is special, a lightning in a bottle and so rarely happens anymore,” explains Murray. Murray, a graduate from Georgetown University returned to Staten Island after college. He connected with his best friends from high school, Joe Gatto, and Sal Vulcano (and originally a fourth friend named Mike Boccio) and together they became “The Tenderloins Comedy Troupe.” Along with Brian Quinn as a frequent guest comedian, the guys performed improv comedy throughout New York City with their first show on March 4, 2000. To fully remember this day, Murray got a tattoo of November 9, 2017, the date of the Madison Square Garden show. It was a huge accomplishment and overwhelming experience for Murray and “The Tenderloins.” It took a few weeks after the fact for Murray to truly digest the wave of emotions from performing onstage to what he considers one of his greatest experiences of his life. 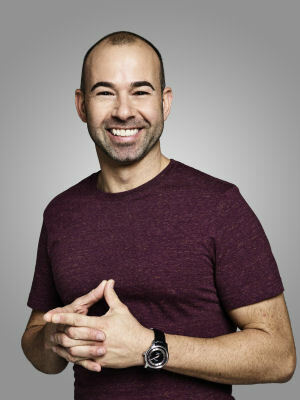 In 2010, Murr, Sal, Joe and Q (Quinn) had the idea of pitching a television show featuring the four of them doing what Murray refers to as a reverse candid camera. The four friends set out to find ways to embarrass each other through a series of challenges to an unsuspecting audience. The guys would find themselves in various situations ranging from working at restaurants with funny requests, pulling cigarettes from people’s mouths, asking awkward and uncomfortable questions to getting people to sign their outrageous petitions. All this is done as three of the friends are giving instructions through an earpiece where the one at hand must say and do what is being told. At the conclusion of each episode, the member who lost the most challenges must go through a given punishment. Daredevils or not, each one of the guys have been placed in situations where they had to face their fears. One of the most memorable punishments Murray had to face was jumping out of a plane which he had to face his greatest fear of heights. In his apartment, Murray proudly displays a photograph of his skydiving endeavor. 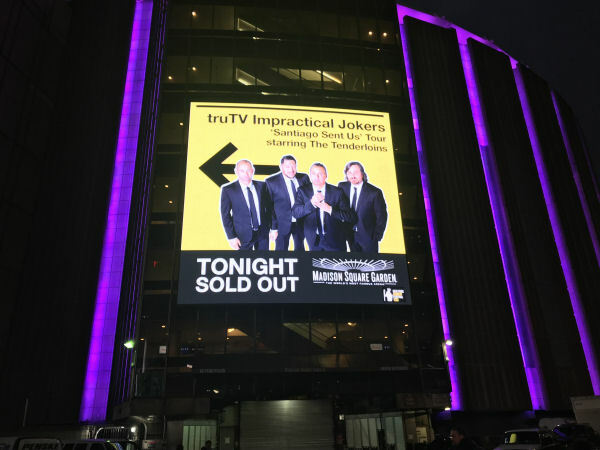 As “Impractical Jokers” continues to reach greater success, it took years to reach the homes of viewers. Murray credits his family for teaching him to reach his goals. “It never crossed my mind that I could not succeed. Ever! They taught me that I could do anything. They made me believe it. That led to many touchy years in my 20’s when I kept failing, failing, and failing, but I never stopped believing,” Murray recalls. As the success of “Impractical Jokers” grew, the Jokers have been able to expand their branding. 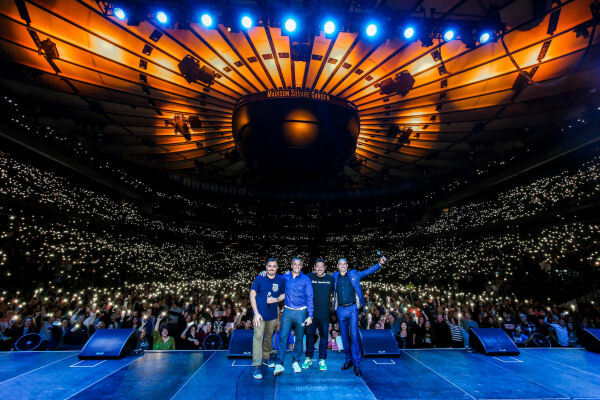 Along with their stand-up routine where they have performed worldwide including throughout the United Kingdom and 5 sold-out shows at the O2 Arena in London, they most recently launched a spinoff show in the UK on Comedy Central called “Say Whaaat?” In addition, their “Impractical Jokers” cruise has been a huge success where fans get an up close and personal opportunity to see their favorite Jokers. “We have our closest friends on the boat too. This year I had 38 family members on the boat which is a blessing that I have the kind of job that I can bring family on vacation with me. It’s pretty wild,” gushes Murray. Murray’s maintains close relationships with his family and friends as they keep him grounded on his rising stardom. His father has even partaken in one of Murray’s punishments on air where Murray had to give his father a lesson on text messaging by showing him his own private text messages. This June, fans will have the opportunity to read Murray’s first published book, “Awakened.” “Awakened” is a thriller novel that Murray spent a year writing and perfecting. The idea began 14 years ago when a friend dared him to write a scary short story. Similar to his journey with “The Tenderloins” and “Impractical Jokers”, his novel took time before anyone took notice. “I spent probably the next year sending out query letter after query letter, sending out sample chapters, manuscripts and I couldn’t get one single publisher, agent, or literary manager to read it. Literally couldn’t get them to read it. It got sent back to me, every single one. I was like, ‘darn it, I know this is a good book. It’s really scary. It’s very exciting.’ Fast forward to 14 years, it sat in my computer,” says Murray. Then last year, Murray was inspired by the guys (Gatto, Quinn, and Vulcano) to give it another chance. They gave him the courage to not allow his past failure stop him. After lunch with an editor, a few days later Murray was made an offer by Harper Collins and now adds published author to his impressive list of achievements. 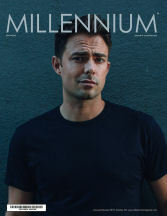 Murray shared his excitement with his fans by promoting “Awakened” on his social media outlets and awarded fans who preordered his book with signed posters, bookmarks, and even personal web calls where he read a chapter of his book to endearing fans. He plans to continue different promotions throughout the year until his book is available in June. And as a show of faith in the novel, Harper Collins just bought the trilogy from Murray, so there will be a new “Awakened” book coming out each summer for the next three years. 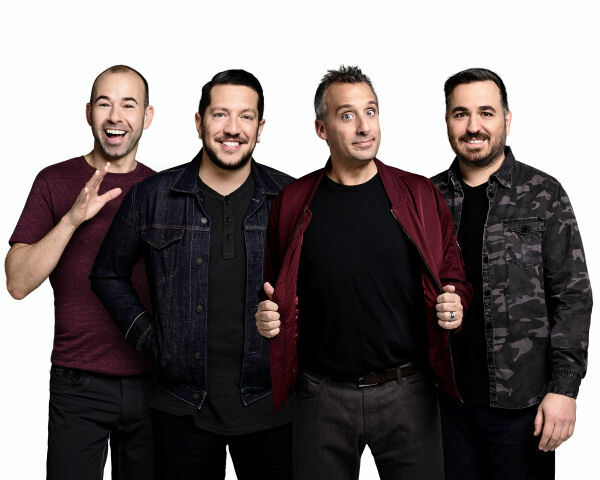 The chemistry between Murray, the Jokers and their fans reached new heights during the season six finale of “Impractical Jokers.” The two-hour episode was in conjunction with the Wounded Warrior Project and filmed at Long Island’s Museum of American Armor. Military service men and women got to watch Murray and his friends in action. One astonishing act made by three servicemen was their agreement to have identical tattoos inked on them as Murray, Quinn and Vulcano had received during a punishment from a previous season. The tattoos were of a skydiving ferret, a cat that read “38, lives alone, has 3 cats,” and a portrait picture of Jaden Smith. Murray himself was shocked at how willing these three men followed through with the tattoos! Growing up, Murray bonded with his dad watching the iconic “Airplane” and “The Naked Gun” movies. The style of comedy from these movies influenced Murray and his friends in a throwback to slapstick humor. A few years ago, after sending a few DVDs of “Impractical Jokers” to the creator and movie director David Zucker, Murray and the guys received an email from Zucker himself. “It’s like midnight on a Saturday, and email comes from David Zucker to the four of us. Within a second the guys and I all are on the phone screaming at each other. I have the email framed. It’s signed by David Zucker. The email says something to the effect of, ‘I just watched your show, all the DVDs you sent me, and I cannot watch for more than twenty minutes at a time without crying from laughter.’ He is my idol. To get that respect from an idol of mine was mind blowing,” explains Murray. Zucker has even joined Murray on two of the “Impractical Jokers” cruises where they have showed his movies and share a Q&A with him on board. Another iconic talent Murray has come to know is musical performer and composer, Yanni. About three years ago, Murray had the opportunity to do a promotion for his network by having fans win a chance to have dinner with Murray followed by a Yanni concert at the Barclays Center in New York afterwards. To the delight of fans, Murray is planning to do a special one-night live concert with Yanni later in the year. While the specifics of the evening are under wraps, there will definitely be a special surprise that Murray fans don’t want to miss! As Murray ended 2017 with many accomplishments and life changing experiences, 2018 will not disappoint. Murray and the guys are hoping to have an “Impractical Jokers” movie on the way. With his perpetual smile, gratitude in life, and persistence for success, Murray will no doubt continue to make his dreams come true! 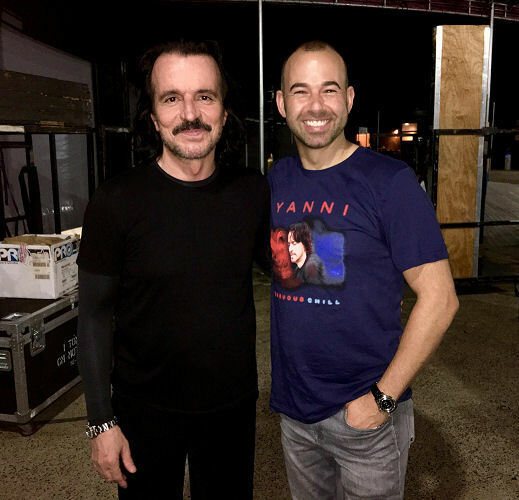 You can follow Murray on Twitter @jamessmurray and Instagram @therealmurr. You can also frequently find him doing live videos for fans on Facebook at James Murray.